SUBHEAD: Global conflicts are increasingly fueled by the desire for oil and natural gas -- and the funds they generate. 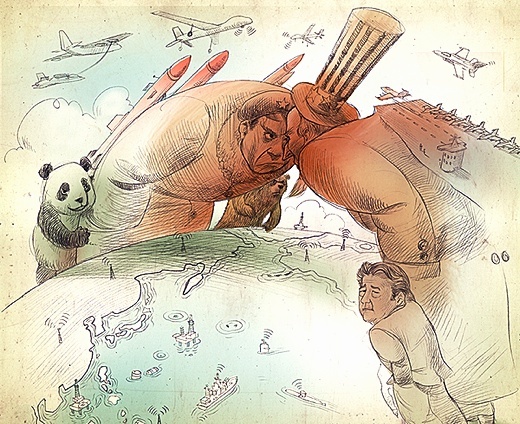 Image above: Illustration of major powers facing off over energy resources from Asia to the Arctic by Jon Berkeley. From (http://www.holytrousers.com/94574/2428107/illustration/energy-wars). Iraq, Syria, Nigeria, South Sudan, Ukraine, the East and South China Seas: wherever you look, the world is aflame with new or intensifying conflicts. At first glance, these upheavals appear to be independent events, driven by their own unique and idiosyncratic circumstances. But look more closely and they share several key characteristics -- notably, a witch’s brew of ethnic, religious, and national antagonisms that have been stirred to the boiling point by a fixation on energy. In each of these conflicts, the fighting is driven in large part by the eruption of long-standing historic antagonisms among neighboring (often intermingled) tribes, sects, and peoples. In Iraq and Syria, it is a clash among Sunnis, Shiites, Kurds, Turkmen, and others; in Nigeria, among Muslims, Christians, and assorted tribal groupings; in South Sudan, between the Dinka and Nuer; in Ukraine, between Ukrainian loyalists and Russian-speakers aligned with Moscow; in the East and South China Sea, among the Chinese, Japanese, Vietnamese, Filipinos, and others. It would be easy to attribute all this to age-old hatreds, as suggested by many analysts; but while such hostilities do help drive these conflicts, they are fueled by a most modern impulse as well: the desire to control valuable oil and natural gas assets. Make no mistake about it, these are twenty-first-century energy wars. It should surprise no one that energy plays such a significant role in these conflicts. Oil and gas are, after all, the world’s most important and valuable commodities and constitute a major source of income for the governments and corporations that control their production and distribution. Indeed, the governments of Iraq, Nigeria, Russia, South Sudan, and Syria derive the great bulk of their revenues from oil sales, while the major energy firms (many state-owned) exercise immense power in these and the other countries involved. Whoever controls these states, or the oil- and gas-producing areas within them, also controls the collection and allocation of crucial revenues. Despite the patina of historical enmities, many of these conflicts, then, are really struggles for control over the principal source of national income. Moreover, we live in an energy-centric world where control over oil and gas resources (and their means of delivery) translates into geopolitical clout for some and economic vulnerability for others. Because so many countries are dependent on energy imports, nations with surpluses to export -- including Iraq, Nigeria, Russia, and South Sudan -- often exercise disproportionate influence on the world stage. What happens in these countries sometimes matters as much to the rest of us as to the people living in them, and so the risk of external involvement in their conflicts -- whether in the form of direct intervention, arms transfers, the sending in of military advisers, or economic assistance -- is greater than almost anywhere else. The Islamic State of Iraq and Syria (ISIS), the Sunni extremist group that controls large chunks of western Syria and northern Iraq, is a well-armed militia intent on creating an Islamic caliphate in the areas it controls. In some respects, it is a fanatical, sectarian religious organization, seeking to reproduce the pure, uncorrupted piety of the early Islamic era. At the same time, it is engaged in a conventional nation-building project, seeking to create a fully functioning state with all its attributes. As the United States learned to its dismay in Iraq and Afghanistan, nation-building is expensive: institutions must be created and financed, armies recruited and paid, weapons and fuel procured, and infrastructure maintained. Without oil (or some other lucrative source of income), ISIS could never hope to accomplish its ambitious goals. However, as it now occupies key oil-producing areas of Syria and oil-refining facilities in Iraq, it is in a unique position to do so. Oil, then, is absolutely essential to the organization’s grand strategy. Syria was never a major oil producer, but its prewar production of some 400,000 barrels per day did provide the regime of Bashar al-Assad with a major source of income. Now, most of the country’s oil fields are under the control of rebel groups, including ISIS, the al-Qaeda-linked Nusra Front, and local Kurdish militias. At first, many rebel groups were involved in these extractive activities, but since January, when it assumed control of Raqqa, the capital of the province of that name, ISIS has been the dominant player in the oil fields. In addition, it has seized fields in neighboring Deir al-Zour Province along the Iraq border. Indeed, many of the U.S.-supplied weapons it acquired from the fleeing Iraqi army after its recent drive into Mosul and other northern Iraqi cities have been moved into Deir al-Zour to help in the organization’s campaign to take full control of the region. In Iraq, ISIS is fighting to gain control over Iraq’s largest refinery at Baiji in the central part of the country. It appears that ISIS sells oil from the fields it controls to shadowy middlemen who in turn arrange for its transport -- mostly by tanker trucks -- to buyers in Iraq, Syria, and Turkey. These sales are said to provide the organization with the funds needed to pay its troops and acquire its vast stockpiles of arms and ammunition. However the present fighting in northern Iraq plays out, it is obvious that there, too, oil is a central factor. ISIS seeks both to deny petroleum supplies and oil revenue to the Baghdad government and to bolster its own coffers, enhancing its capacity for nation-building and further military advances. At the same time, the Kurds and various Sunni tribes -- some allied with ISIS -- want control over oil fields located in the areas under their control and a greater share of the nation’s oil wealth. The present crisis in Ukraine began in November 2013 when President Viktor Yanukovych repudiated an agreement for closer economic and political ties with the European Union (EU), opting instead for closer ties with Russia. That act touched off fierce anti-government protests in Kiev and eventually led to Yanukovych’s flight from the capital. With Moscow’s principal ally pushed from the scene and pro-EU forces in control of the capital, Russian President Vladimir Putin moved to seize control of the Crimea and foment a separatist drive in eastern Ukraine. For both sides, the resulting struggle has been about political legitimacy and national identity -- but as in other recent conflicts, it has also been about energy. Ukraine is not itself a significant energy producer. It is, however, a major transit route for the delivery of Russian natural gas to Europe. According to the U.S. Energy Information Administration (EIA), Europe obtained 30% of its gas from Russia in 2013 -- most of it from the state-controlled gas giant Gazprom -- and approximately half of this was transported by pipelines crossing Ukraine. As a result, that country plays a critical role in the complex energy relationship between Europe and Russia, one that has proved incredibly lucrative for the shadowy elites and oligarchs who control the flow of gas, whille at the same time provoking intense controversy. Disputes over the price Ukraine pays for its own imports of Russian gas twice provoked a cutoff in deliveries by Gazprom, leading to diminished supplies in Europe as well. Given this background, it is not surprising that a key objective of the “association agreement” between the EU and Ukraine that was repudiated by Yanukovych (and has now been signed by the new Ukrainian government) calls for the extension of EU energy rules to Ukraine’s energy system -- essentially eliminating the cozy deals between Ukrainian elites and Gazprom. Russian leaders have many reasons to despise the association agreement. For one thing, it will move Ukraine, a country on its border, into a closer political and economic embrace with the West. Of special concern, however, are the provisions about energy, given Russia’s economic reliance on gas sales to Europe -- not to mention the threat they pose to the personal fortunes of well-connected Russian elites. In late 2013 Yanukovych came under immense pressure from Vladimir Putin to turn his back on the EU and agree instead to an economic union with Russia and Belarus, an arrangement that would have protected the privileged status of elites in both countries. However, by moving in this direction, Yanukovych put a bright spotlight on the crony politics that had long plagued Ukraine’s energy system, thereby triggering protests in Kiev’s Independence Square (the Maidan) -- that led to his downfall. Once the protests began, a cascade of events led to the current standoff, with the Crimea in Russian hands, large parts of the east under the control of pro-Russian separatists, and the rump western areas moving ever closer to the EU. In this ongoing struggle, identity politics has come to play a prominent role, with leaders on all sides appealing to national and ethnic loyalties. Energy, nevertheless, remains a major factor in the equation. Gazprom has repeatedly raised the price it charges Ukraine for its imports of natural gas, and on June 16th cut off its supply entirely, claiming non-payment for past deliveries. A day later, an explosion damaged one of the main pipelines carrying Russian gas to Ukraine -- an event still being investigated. Negotiations over the gas price remain a major issue in the ongoing negotiations between Ukraine’s newly elected president, Petro Poroshenko, and Vladimir Putin. Energy also played a key role in Russia’s determination to take the Crimea by military means. By annexing that region, Russia virtually doubled the offshore territory it controls in the Black Sea, which is thought to house billions of barrels of oil and vast reserves of natural gas. Nigeria is the largest oil producer in Africa, pumping out some 2.5 million barrels per day. With oil selling at around $100 per barrel, this represents a potentially staggering source of wealth for the nation, even after the private companies involved in the day-to-day extractive operations take their share. Were these revenues -- estimated in the tens of billions of dollars per year -- used to spur development and improve the lot of the population, Nigeria could be a great beacon of hope for Africa. Instead, much of the money disappears into the pockets (and foreign bank accounts) of Nigeria’s well-connected elites. For many Nigerians -- a majority of whom subsist on less than $2 per day -- the corruption in Abuja, when combined with the wanton brutality of the government’s security forces, is a source of abiding anger and resentment, generating recruits for insurgent groups like Boko Haram and winning them begrudging admiration. “They know well the frustration that would drive someone to take up arms against the state,” said National Geographic reporter James Verini of people he interviewed in battle-scarred areas of northern Nigeria. At this stage, the government has displayed zero capacity to overcome the insurgency, while its ineptitude and heavy-handed military tactics have only further alienated ordinary Nigerians. The conflict in South Sudan has different roots, but shares a common link to energy. Indeed, the very formation of South Sudan is a product of oil politics. A civil war in Sudan that lasted from 1955 to 1972 only ended when the Muslim-dominated government in the north agreed to grant more autonomy to the peoples of the southern part of the country, largely practitioners of traditional African religions or Christianity. However, when oil was discovered in the south, the rulers of northern Sudan repudiated many of their earlier promises and sought to gain control over the oil fields, sparking a second civil war, which lasted from 1983 to 2005. An estimated two million people lost their lives in this round of fighting. In the end, the south was granted full autonomy and the right to vote on secession. Following a January 2011 referendum in which 98.8% of southerners voted to secede, the country became independent on that July 9th. The new state had barely been established, however, when conflict with the north over its oil resumed. While South Sudan has a plethora of oil, the only pipeline allowing the country to export its energy stretches across North Sudan to the Red Sea. This ensured that the south would be dependent on the north for the major source of government revenues. Furious at the loss of the fields, the northerners charged excessively high rates for transporting the oil, precipitating a cutoff in oil deliveries by the south and sporadic violence along the two countries’ still-disputed border. Finally, in August 2012, the two sides agreed to a formula for sharing the wealth and the flow of oil resumed. Fighting has, however, continued in certain border areas controlled by the north but populated by groups linked to the south. With the flow of oil income assured, the leader of South Sudan, President Salva Kiir, sought to consolidate his control over the country and all those oil revenues. Claiming an imminent coup attempt by his rivals, led by Vice President Riek Machar, he disbanded his multiethnic government on July 24, 2013, and began arresting allies of Machar. The resulting power struggle quickly turned into an ethnic civil war, with the kin of President Kiir, a Dinka, battling members of the Nuer group, of which Machar is a member. Despite several attempts to negotiate a cease-fire, fighting has been under way since December, with thousands of people killed and hundreds of thousands forced to flee their homes. As in Syria and Iraq, much of the fighting in South Sudan has centered around the vital oil fields, with both sides determined to control them and collect the revenues they generate. As of March, while still under government control, the Paloch field in Upper Nile State was producing some 150,000 barrels a day, worth about $15 million to the government and participating oil companies. The rebel forces, led by former Vice President Machar, are trying to seize those fields to deny this revenue to the government. “The presence of forces loyal to Salva Kiir in Paloch, to buy more arms to kill our people... is not acceptable to us,” Machar said in April. “We want to take control of the oil field. It’s our oil.” As of now, the field remains in government hands, with rebel forces reportedly making gains in the vicinity. An energy-rich offshoot of the western Pacific, that sea, long a focus of contention, is rimmed by China, Vietnam, the island of Borneo, and the Philippine Islands. Tensions peaked in May when the Chinese deployed their largest deepwater drilling rig, the HD-981, in waters claimed by Vietnam. Once in the drilling area, about 120 nautical miles off the coast of Vietnam, the Chinese surrounded the HD-981 with a large flotilla of navy and coast guard ships. When Vietnamese coast guard vessels attempted to penetrate this defensive ring in an effort to drive off the rig, they were rammed by Chinese ships and pummeled by water cannon. No lives have yet been lost in these encounters, but anti-Chinese rioting in Vietnam in response to the sea-borne encroachment left several dead and the clashes at sea are expected to continue for several months until the Chinese move the rig to another (possibly equally contested) location. The riots and clashes sparked by the deployment of HD-981 have been driven in large part by nationalism and resentment over past humiliations. The Chinese, insisting that various tiny islands in the South China Sea were once ruled by their country, still seek to overcome the territorial losses and humiliations they suffered at the hands the Western powers and Imperial Japan. The Vietnamese, long accustomed to Chinese invasions, seek to protect what they view as their sovereign territory. For common citizens in both countries, demonstrating resolve in the dispute is a matter of national pride. But to view the Chinese drive in the South China Sea as a simple matter of nationalistic impulses would be a mistake. The owner of HD-981, the China National Offshore Oil Company (CNOOC), has conducted extensive seismic testing in the disputed area and evidently believes there is a large reservoir of energy there. “The South China Sea is estimated to have 23 billion tons to 30 billion tons of oil and 16 trillion cubic meters of natural gas, accounting for one-third of China's total oil and gas resources,” the Chinese news agency Xinhua noted. Moreover, China announced in June that it was deploying a second drilling rig to the contested waters of the South China Sea, this time at the mouth of the Gulf of Tonkin. As the world’s biggest consumer of energy, China is desperate to acquire fresh fossil fuel supplies wherever it can. Although its leaders are prepared to make increasingly large purchases of African, Russian, and Middle Eastern oil and gas to satisfy the nation’s growing energy requirements, they not surprisingly prefer to develop and exploit domestic supplies. For them, the South China Sea is not a “foreign” source of energy but a Chinese one, and they appear determined to use whatever means necessary to secure it. Because other countries, including Vietnam and the Philippines, also seek to exploit these oil and gas reserves, further clashes, at increasing levels of violence, seem almost inevitable. As these conflicts and others like them suggest, fighting for control over key energy assets or the distribution of oil revenues is a critical factor in most contemporary warfare. While ethnic and religious divisions may provide the political and ideological fuel for these battles, it is the potential for mammoth oil profits that keeps the struggles alive. Without the promise of such resources, many of these conflicts would eventually die out for lack of funds to buy arms and pay troops. So long as the oil keeps flowing, however, the belligerents have both the means and incentive to keep fighting. • Michael T. Klare, a TomDispatch regular, is a professor of peace and world security studies at Hampshire College and the author, most recently, of The Race for What’s Left. A documentary movie version of his book Blood and Oil is available from the Media Education Foundation.